On July 31 and August 1, 1966, there was a flurry of sightings in the general area of Washington and Baltimore. Prince Georges County police watched lighted objects maneuvering erratically across the sky. In Baltimore, residents of the Country Ridge housing development were awakened early in the morning of August 1 by barking dogs. At least two families saw a hovering, egg-shaped object with flashing lights on the top and bottom. The object made a loud whirring or whining noise, according to the Baltimore News-American (8/1). That night, physicist Vasil Uzunoglu, a consultant on micro-electronics, was driving north and east on the Capital (Washington, D.C.) Beltway about 10:55 p.m. (EDT). He had passed Andrews Air Force Base when, out of his open left window, he saw a light descend and appear to hover briefly, then move rapidly to the east. Minutes later an oblong object "like a submarine" descended over a house to his left. This time the UFO was much closer, its apparent size as large as the house. 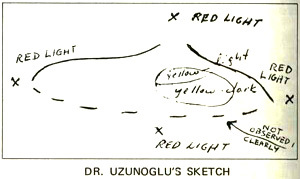 Dr. Uzunoglu slowed his car and looked at the object, now an estimated 200 feet away, for about ten seconds. At this point it showed details of structure: a peaked top with a red light; an apparently rounded undersurface with red lights; and a large yellow revolving light slightly off-center. "I could see clearly the top of the body, which was a dark, non-shining material with no sharp edges," he told NICAP. "The most striking part was the eye-like object off-center to the right, with two distinct yellow regions. . . (The lower region) was revolving, blinking or scanning. . . "
Dr. Uzunoglu turned his attention to the highway again, noting that no other cars were in sight. When he glanced back again, the object was moving south "at a very high speed and comparatively low elevation." He said it disappeared in seconds.